Comments: A bertha of Bloemwerk, excellent technique. Note the use of the gimp instead of any raised work, the single tally fillings, and the ‘islands’ in the irregular picoted brides. 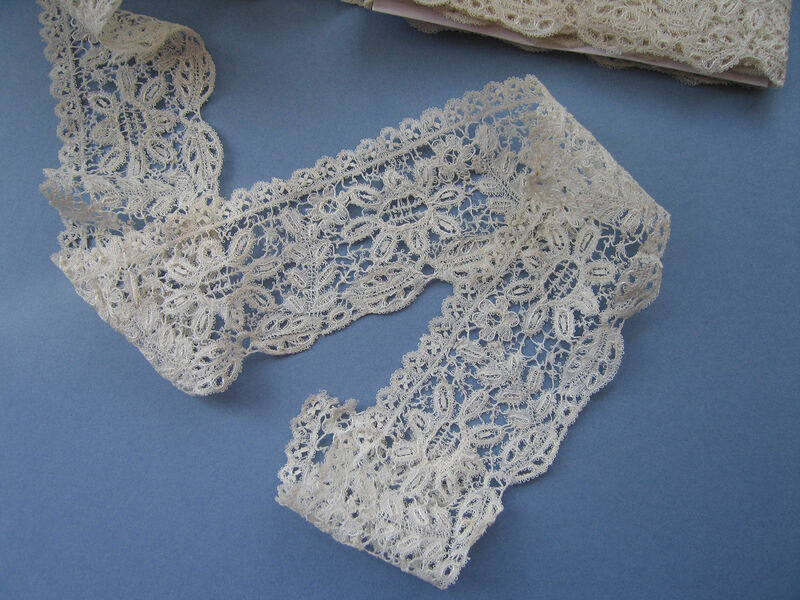 An good example of this type of lace. Soilage: Seller cites discoloration to inner neckline and 2 brown age spots to back edge. Sold for 80.00 GBP, 4 bidders. 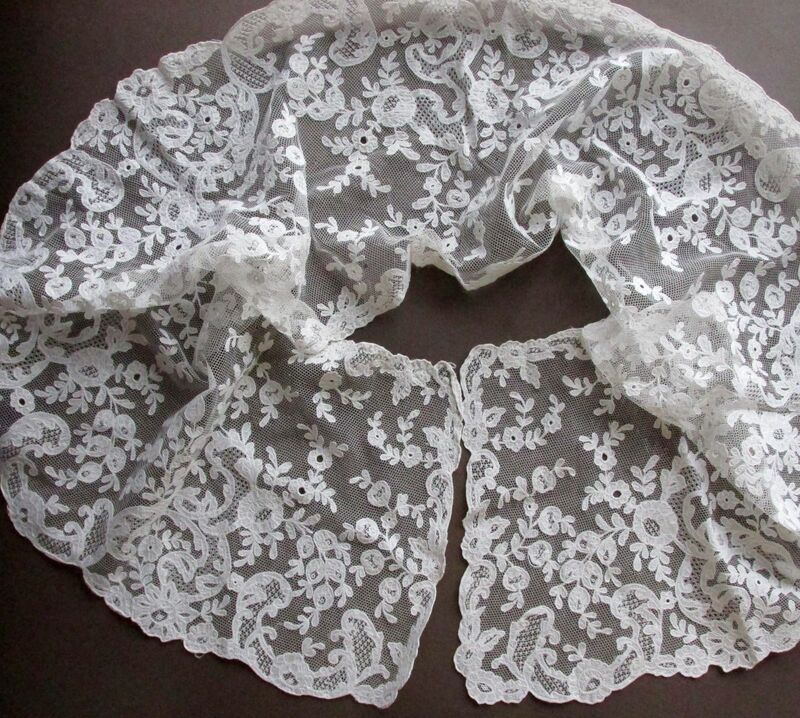 Comments: A bertha or narrow shawl of muslin applique on machine net. 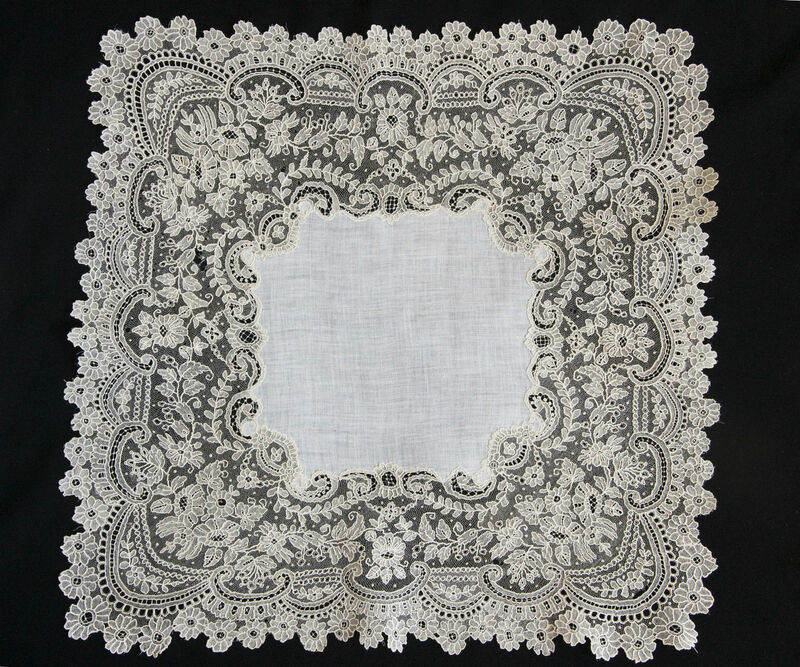 The motifs are attached with chainstitch, which is a sign of Belgian work. Some good needlerun fillings. I find the floral design good, although a little simple in the motifs, basically meaning that there wasn’t any extra work in giving the flowers and leaves any finesse. 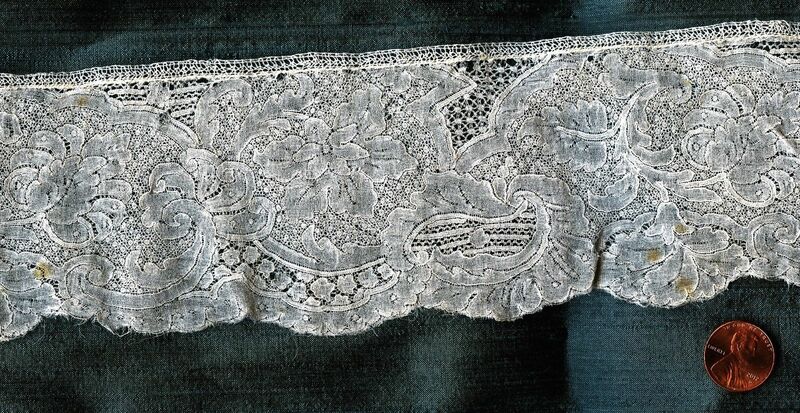 Yes, this technique was used in Carrickmacross applique, however I’d prefer to name both types of laces a more generic ‘muslin applique on machine tulle’. Then get into specifics about locality of manufacture. 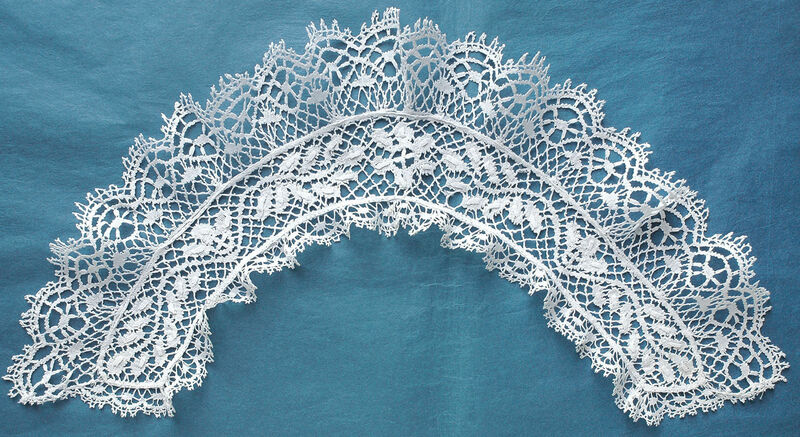 (this is the type of lace used on Princess Diana’s wedding dress train). Damage: Pinholes and small holes in the tulle. Soilage: Seller cites slight discoloration on part of the neckline. 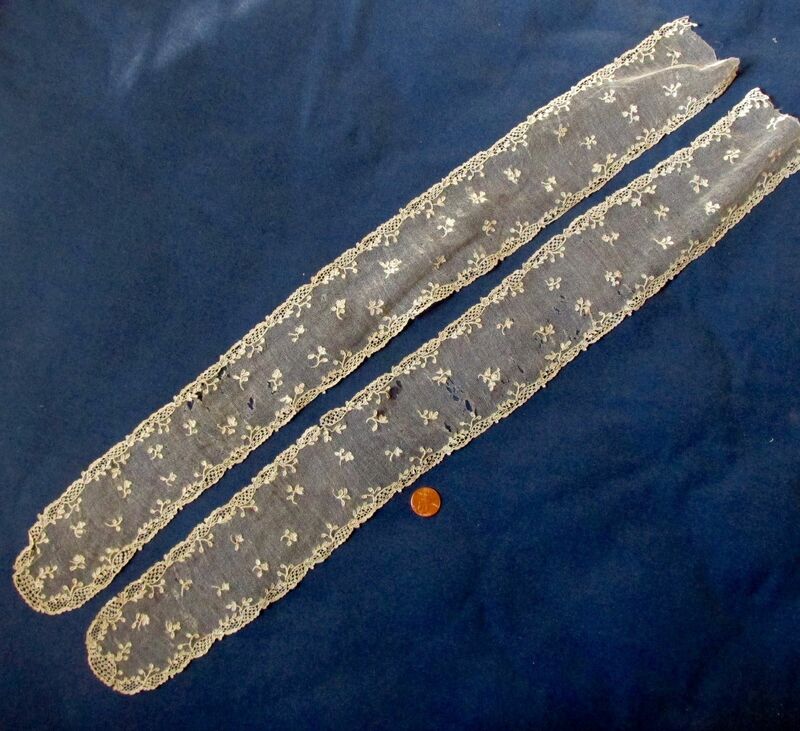 Comments: A later 18th c pair of Alençon lappets, obviously treasured due to all the repairs. 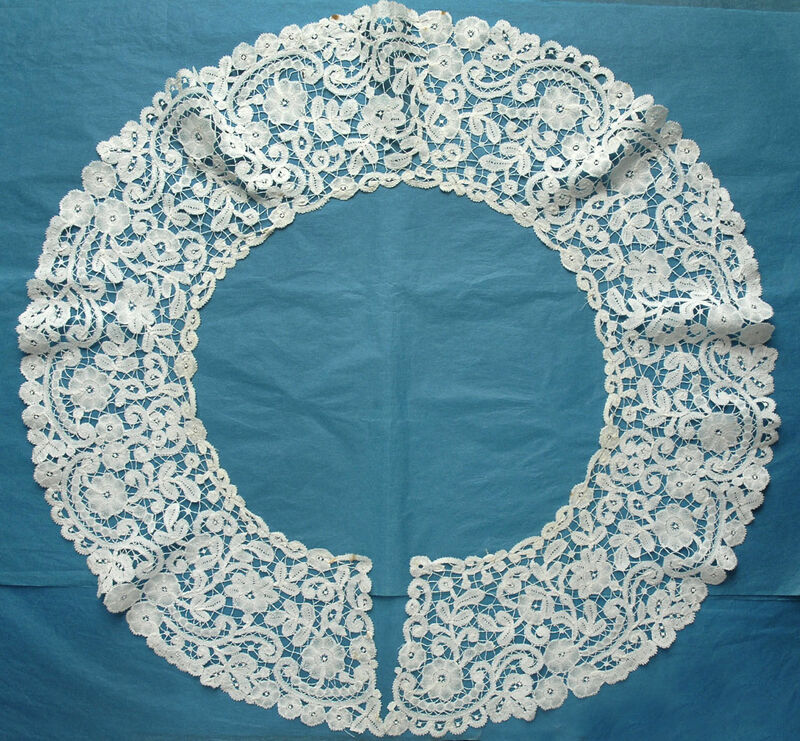 This is a later design with small designs in the centers and a narrow border full of decorative ‘mode’ filings around the sides and lower ends. 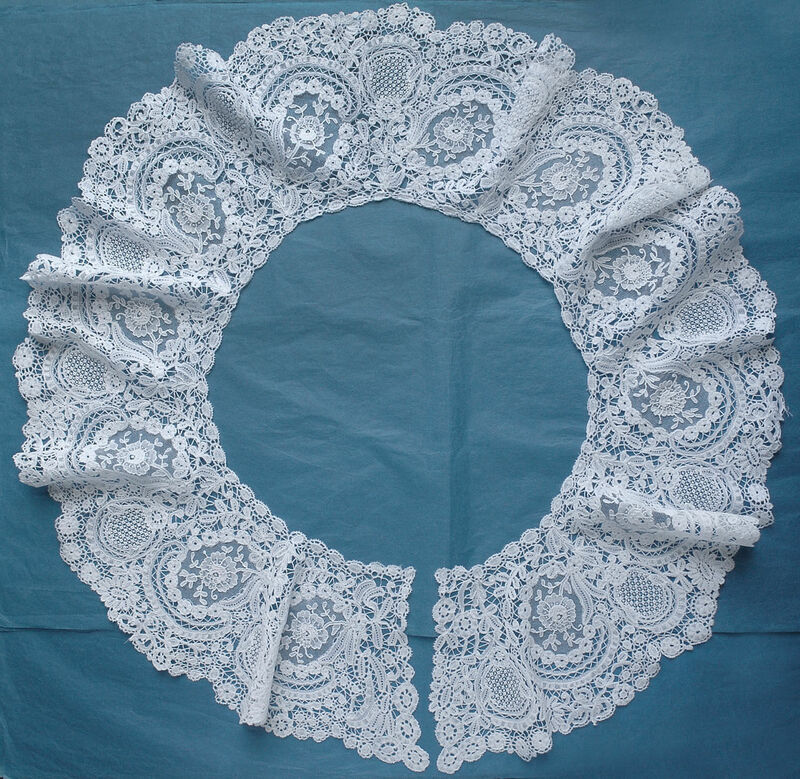 It is a simple concept which went well with the lighter muslin dresses that came in around 1780. Modifications: I think the tops are close to original. Looks like few motifs or parts of motifs went missing in the repair process. Damage: Holes and pinholes in the ground, also many repairs including replacement of ground with machine tulle. Finish: Small creases in parts of the ground. Comments: Wish there were more of this. An impressive Mechlin border with partridge eye fillings, also some complex snowflakes, and something approaching quatrefoils. Also a nice bar and zigzag pattern. It really doesn’t have much that can be called a ‘ground’ at this stage. I find the design a bit too naturalistic to be considered in the Bizarre style (but it’s close), and yet the motifs don’t have much of the blockiness that later examples sometimes exhibit. The the set of Valenciennes lappets in the photo next to the listed piece from my own collection represents a truer ‘Bizarre’ style – they have an element of abstractness missing from the listed piece. Damage: Numerous holes, especially larger ones at one end. Frayed along lower edge. Soilage: Seller cites ivory color. Some localized brown spotting. Sold for $735.00, 4 bidders. 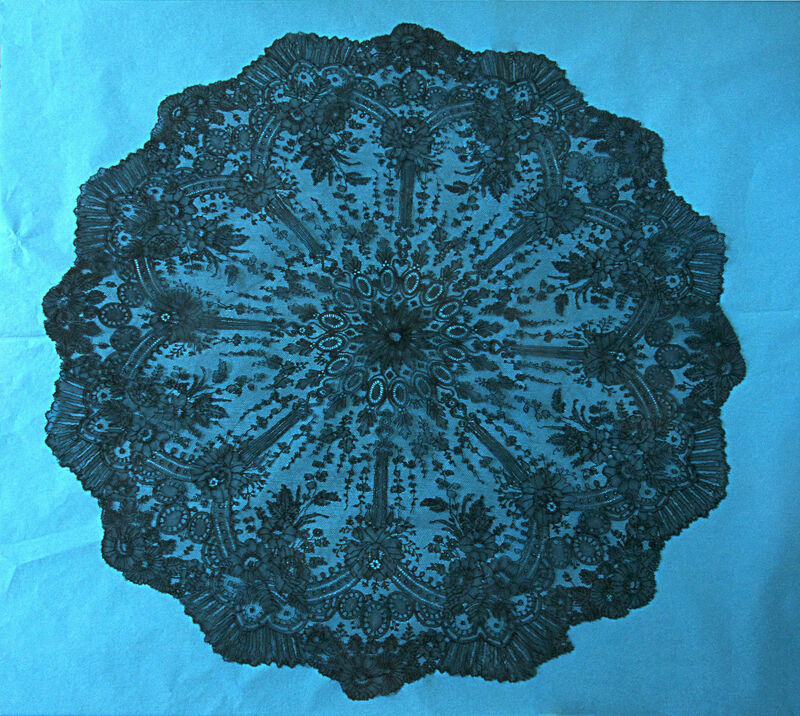 Comments: A Chantilly parasol cover divided into 8 sections (this is pretty typical of lace parasol covers). Elaborate floral design, well executed. Note, no esprits in the ground. I like the holes surrounded by gimp in the strapwork along the outer edge, and the way the little tendrils hang down in the mid section. This would have had a light silk backing attached before mounting. Finish: I think it’s unused – the center hole where the spike of the parasol would go is not open. Sold for 169.00 EUR, 5 bidders. Comments: A Point de Gaze handkerchief, no raised work. Simple decorative ‘mode’ fillings, just some knots and small lines of rings. It doesn’t need much decoration, the design fills the entire space quite well. Excellent technique. Damage: Several holes and pinholes in the mesh. Soilage: Looks like there’s a little localized faint browning. Finish: No creases or wrinkles. Sold for 262.00 EUR, 10 bidders. Comments: A beds collar with a typical arrangement of formed inner piece with a wide border on the outside and a narrow border on the neckline. Raised tallies in the center part. It resembles work done by the Bucks Cottage Worker’s Agency. Soilage: Looks clean, almost overly white. Finish: There might be a center fold, hard to tell. Size: 37″ neckline, 6.5″ deep. Comments: A bertha of Brussels Duchesse. Raised petal roses in the Point de Gaze inserts. Conventional motifs all around, but what really makes this piece are the large inserts of grid ring and knot decorative ‘mode’ fillings. Damage: Nothing obvious from the photos. PtdG mesh looks good. Soilage: Seller says it has been laundered and is a soft old white color. Sold for 123.00 GBP, 5 bidders. Comments: A long insertion of Beds, quite a complex floral design. It does look like it is all one piece, including the upper narrow border. The design includes leaves and flowers with some nice gimp work and woven tally fillings. Sold for $61.00, 3 bidders. 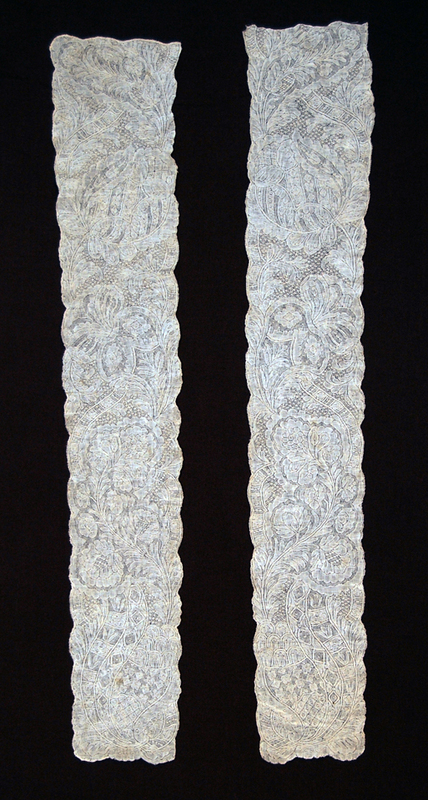 Size: 23″ each, 3.25″ to 2.5″ in width. 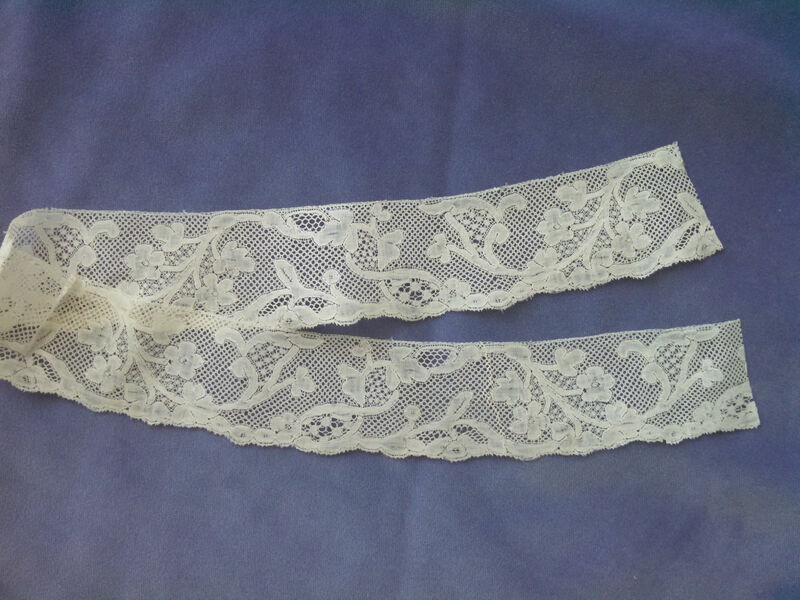 Comments: A pair of Alençon lappets, same general style as the ones reviewed above, but a slightly lighter design. Damage: Holes in the mesh, some repairs. Soilage: A little beige in color, some localized brown spots. Comments: A short length of Mechlin with a 5-hole ground. The design is Louis XV, and they did experiment with grounds in this period. Beautifully woven, very precise work. Modifications: Ends cut, one seam. Damage: One break in the foot edge, minor. Sold for $92.00, 3 bidders. 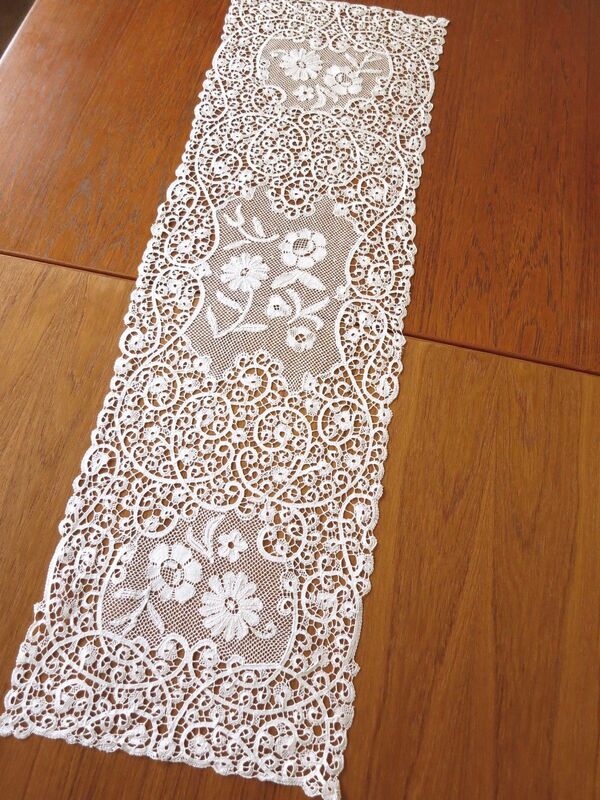 Comments: This Cantu table runner is unusual because of the inserts – looks like a pieced lace with a kind of dieppe ground added in. Otherwise it’s a conventional Cantu piece.